People have been giving varied reactions to the death of Russian former spy Alexander Litvinenko. 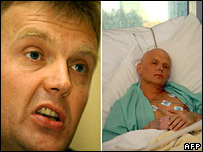 Mr Litvinenko, 43, died on Thursday evening at University College Hospital, London, after apprently being poisoned. British MEP Gerard Batten, who met Mr Litvinenko several times, said Mr Litvinenko was warned his life was in danger shortly before he was taken fatally ill.
A spokesman for Russian president Vladimir Putin said accusations that Moscow was involved were "nonsense". Mr Batten told BBC News: "I'm shocked. I'm very saddened at Alexander's death. He was a very likeable man. I got on very well with him on the occasions I met him and spoke to him on the telephone. "I think that what's very concerning about this is the accusation that the Russian secret services were involved in this. "I had a conversation at the weekend with Mario Scaramella, the man that Alexander was meeting in the sushi bar on 1 November, and Mario was himself in fear of his life. "He was going off to hospital to have a check to make sure that he wasn't contaminated in any way, and what he told me was one of the reasons he came over to speak to Alexander is because another ex-KGB contact that he had had warned him that his life was in danger, Alexander's life was in danger, and that two other named people were also in danger." Mr Scaramella is involved in an Italian parliamentary inquiry into Russian secret service activity. The cause of the death of Mr Litvinenko, who has been critical of the Russian government, is being investigated by Scotland Yard. Friends believe he was poisoned. Intelligence analyst Glenmore Trenear Harvey, a friend of Mr Litvinenko, said there were people who would want to target the former agent. "He headed up one of the internal investigations branches that were looking into the corruption and coercion that was going on within the Russian intelligence service so he made a lot of enemies way back then," he said. "But I think one has to look to more recent times and certainly his friendship with the journalist Anna Politkovskaya, who was murdered last month. "I think that that is probably an indication of where things are coming from." Dmitry Peskov, deputy spokesman for Russian president Vladimir Putin, reiterated the Kremlin's insistence that it had nothing to do with Mr Litvinenko's death. Mr Peskov said: "Any death is always a tragedy. Now it's up to the UK law enforcement agencies to investigate what happened. "As for the accusations that Moscow might be involved in this, we have already said that this is sheer nonsense, and there's nothing we can add to this. "I don't have any comment on Mr Litvinenko's role in Russian political life because, frankly, there's nothing to comment on here." BBC correspondent Jonny Dymond, in Helsinki for a summit between the European Union and Russia, said a source in Mr Putin's delegation said suggestions of Russian government involvement were "unbelievable". Head of the Russian parliament's Foreign Affairs Committee Konstantin Kosachyov expressed his condolences to those who knew Mr Litvinenko. "I think accusations in the Western media that the Russian special services had something to do with his death are completely ungrounded. "I don't see any reason for our special services to carry out such an operation. Our special services don't do these sort of things. "I can name a lot of people who are enemies of Russia and who would benefit from his death, people who would use it for their own political gain. "I call on everybody to refrain from comment until the investigation is over. If there is anything Russia can do to help the investigation, I'm sure this help will be rendered." A spokesman for the Russia's Foreign Intelligence Service said: "We've said all we wanted to say. Even after his death, there's nothing new to say. "We know the police are investigating, and we're waiting for the results of this investigation. "Of course this is something that interests people everywhere, but we don't want to comment until we've heard from the police."